Planning a Beautiful Wedding in Orlando in Two Months is not as hard as it might seem. Roasted Salmon with Lemon Cream Sauce makes a wonderful addition to a wedding brunch. If someone would have told me that we would be creating a beautiful wedding in Orlando with brunch in only two months I would not have believed them. But that is exactly what happened. My daughter surprised us a couple of months ago. She was engaged. But not only was she and her long time beau engaged but they had decided to get married when my other daughter and family were in Florida for vacation which would be in about two months. Whoa, now how would we plan a wedding in two months. I always thought she would have a destination wedding and the whole family would fly to some exciting location, like Hawaii, and we would have the ceremony there. But they live in Orlando and had to work right up until a few days before the wedding. Both are in the entertainment industry and really don’t get many vacations and especially not time off to plan a wedding. 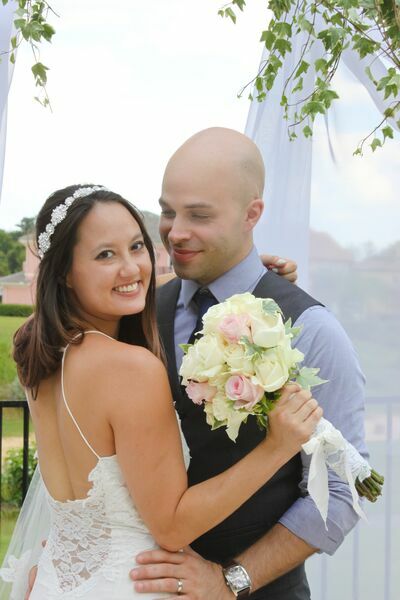 I spent a lot of time in Orlando helping to plan the wedding even though some decisions were made quickly and I wasn’t sure it would turn out, but it did! The wedding was beautiful! 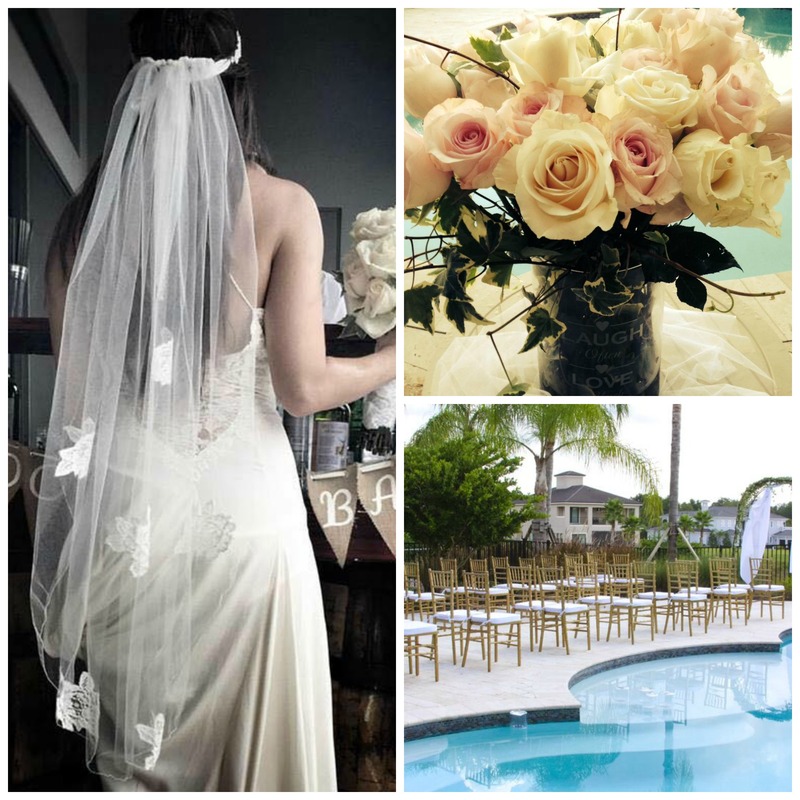 It was casual, lovely and at a home rented at Reunion Resort in Kissimmee and the wedding ceremony was performed by the pool. Some people said it was the best wedding they had ever been to! The flowers were ordered online from Sam’s Club. They arrived two days before the wedding and were beautiful! I would do it again. When she told me that she wanted her younger brother to perform the ceremony, I was very skeptical about whether they would actually be married when it was all over! That’s a mother for you, worrying about everything. Well it worked out fine, my son applied to be a minister online and he was recognized by the state of Florida. He conducted a beautiful ceremony. Happy Daughter and new Son-in-law after a beautiful ceremony performed by her brother. 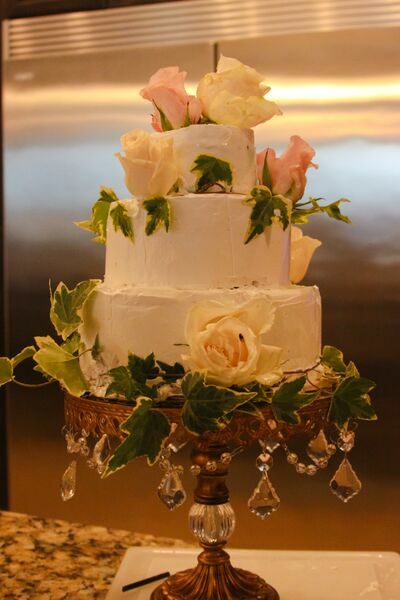 We decorated an Ice Cream Wedding Cake From Cold Stone Creamery with Flowers. The wedding ceremony was followed by a brunch and then a couple of hours later a barbecue. Everything was mostly vegetarian. The bride is vegetarian and the groom is pescatarian and will eat fish. There were some meat dishes at the wedding and those were done on the barbecue grill like hamburgers, hot dogs, vegetarian hot dogs. For the website pictures I’m remaking everything because we really didn’t get pictures of the food. So today here is the Salmon with Dill Sauce. It was served with bagels, croissants, cream cheese, capers, onions, and lemon dill sauce. The other food listed above will be posted here soon. 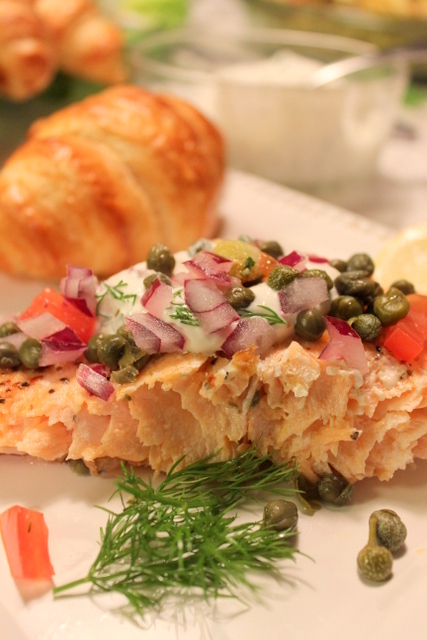 Roasted Salmon with Lemon Dill Cream Sauce and capers, red onions, tomatoes, bagels, and croissants. 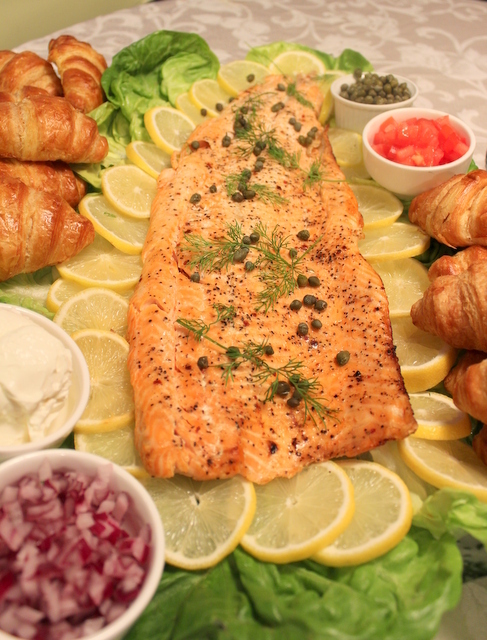 Roasted Salmon for Brunch with your favorite accompaniments, capers, red onions, lemons, cream cheese, creamy dill sauce, bagels, croissants. Place large piece of aluminum foil on large flat roasting pan or cookie sheet. Place salmon on foil and brush both sides of salmon with olive oil and sprinkle both sides with seasoned pepper, salt and dill. Cover with an additional piece of foil and seal salmon in the two pieces of foil. Place in oven and roast for 12 per pound for medium done and 15 minutes per pound for well done. Salmon should be a medium doneness in 36 minutes. When salmon is done place on a prepared large platter. Put in refrigerator for a few hours, or overnight. When serving surround the salmon with lemons, tomatoes, capers, red onions, croissants, bagels, cream cheese and lemon dill sauce. Mix sour cream, dill and lemon juice together and set aside. Beautiful pics, food & bride! Thank you Alicia. Everything turned out beautiful! How cool! My husband and I were married in Orlando, living there at the time. Looks like a wonderful day and a wonderful recipe to remember it by. Thanks Christie. The day was beautiful. I love Orlando and hope to be down here full time in the next 2 years. Thank you Kacey. Destination weddings are wonderful but sometimes not all your friends are able to go. Thanks Susan. It was fun! Congratulations, the photos are beautiful. That salmon looks amazing, can't wait to try it! Thanks Kellie. It's one of my favorite ways to make and eat salmon.